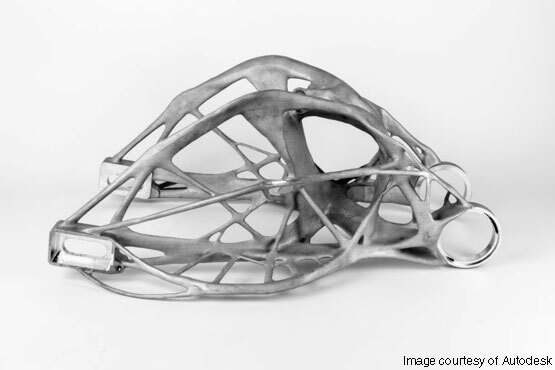 Generative design is the next evolution in automated design. Could Autodesk's new software which utilises artificially intelligent algorithms, as well as cloud processing, turn the product design development process on it's head? The user creates basic CAD blocks for areas which must be included or excluded in the design, such as boss features. The material, loading forces, weight, cost, and factors of safety. Using a method called 'form synthesis' the AI takes cues from nature, growing structures organically like bone. An array of these structures are generated leaving the user with tools to select their favourite iteration. This has the potential to minimise the number of components in a product, as well as enhancing component performance. It is truely game-changing within high-performance engineering. With regards to product design it could reduce product development time by creating multiple iterations of a component in a fraction of the time, as well as changing the form of consumer products. However, the software can only produce designs for either 3D printing, 3, or 5-axis CNC machining. These manufacturing methods aren't viable for mass-manufacture, it brings into question whether generative design will be software only applicable to the high performance engineering field, rather than product deisgn. Perhaps if their algorithms are one day developed to include the ability to generate moldable shapes for injection moulding or die casting, then the product design landscape could be truly changed significantly.